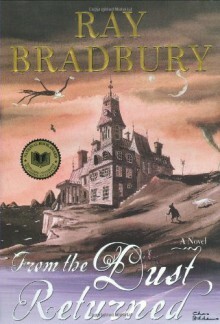 Ray Bradbury, America's most beloved storyteller, has spent a lifetime carrying readers to exhilarating and dangerous places, from dark street comers in unfamiliar cities and towns to the edge of the universe. Now, in an extraordinary flight of the imagination a half-century in the making, he takes us to a most wondrous destination: into the heart of an Eternal FamilyThey have lived for centuries in a house of legend and mystery in upper Illinois -- and they are not like other midwesterners. Rarely encountered in daylight hours, their children are curious and wild; their old ones have survived since before the Sphinx first sank its paws deep in Egyptian sands. And some sleep in beds with lids.Now the house is being readied in anticipation of the gala homecoming that will gather together the farflung branches of this odd and remarkable family. In the past-midnight stillness can be detected the soft fluttering of Uncle Einars wings. From her realm of sleep, Cecy, the fairest and most special daughter, can feel the approach of many a welcome being -- shapeshifter, telepath, somnambulist, vampire -- as she flies high in the consciousness of bird and bat.But in the midst of eager anticipation, a sense of doom pervades. For the world is changing. And death, no stranger, will always shadow this most singular family: Father, arisen from the Earth; Mother, who never sleeps but dreams; A Thousand Times Great Grandmére; Grandfather, who keeps the wildness of youth between his ears.And the boy who, more than anyone, carries the burden of time on his shoulders: Timothy, the sad and different foundling son who must share it all, remember, and tell...and who, alone out of all of them, must one day age and wither and die.By turns lyrical, wistful, poignant, and chilling, From the Dust Returned is the long-awaited new novel by the peerless Ray Bradbury -- a book that will surely be numbered among his most enduring masterworks.